At the 2018 Association of Indiana Solid Waste Management Districts Retreat, Bob Gedert of Resource Recycling Systems shared a plan for how local economic development can create recycling demand. His presentation, Rebuilding America’s Recycling Infrastructure: Economic Development Strategies for Local Communities, gave suggestions for how local communities can help address the need for recycling industries in response to China’s National Sword program. To illustrate the impact China has on recycling in America, Gedert shared these striking facts. In 2017, approximately 33% percent of U.S. recycling commodity exports – worth $5.6 billion – were sent to China. In 2018, less than 5% of US recyclables are shipped and accepted in China. Gedert ended his presentation with a call to action for local recycling leadership to build relationships with local and state economic development staff. 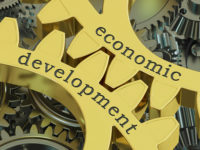 Together, recycling and economic development stakeholders can create new economic development tools that will support businesses which can utilize recycled materials as their feedstock. He pointed to Austin, Texas; Phoenix, Arizona; and Edmonton, Canada as having model programs.